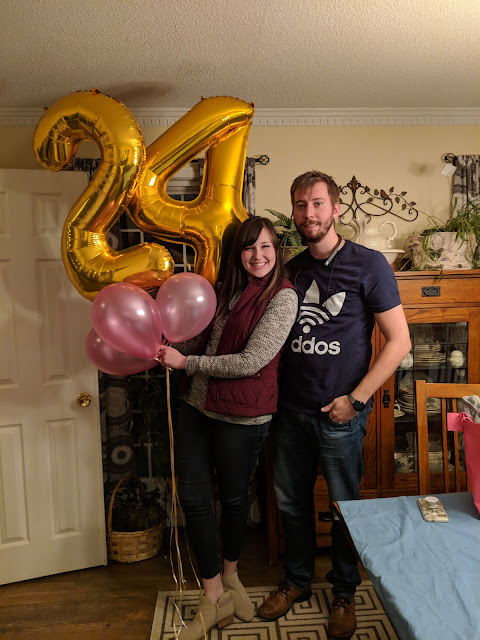 I'm a day late, but yesterday was my birthday! Man, oh man, did my husband Kyle make it a sweet and special day. Kyle is a pretty simple and quiet guy. He's not one to get super excited about holidays, but he's an amazing gift giver and he loves to surprise me! We started off the day by hitting up our local Starbucks on our way to church. He told me he had reservations at 5:30, so we spent our afternoon relaxing and cuddling with our pup (I think Ollie thought it was his birthday too ;)) For dinner, he took me to The Melting Pot which is a delicious fondue restaurant. After dinner, we went to the movies. I LOVE to go to the movies, and we saw The Greatest Showman. It was SUCH a good movie. I absolutely loved it. My sweet sister-in-law and brother-in-law got me these gold balloons. It was my idea of a perfect birthday, and I am so thankful for the friends and family in my life that made it extra special. Twenty-four - you're looking good!